Know whether your property is in a flood zone and plan accordingly. Most floods develop slowly over a period of days but flash floods are different, developing like walls of water in a matter of minutes, often due to intense storms or a dam failure. 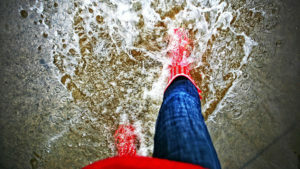 Flooding can create conditions favorable for a fire to occur, either by causing it or by impeding efforts to fight it. While electrical fires can occur for any number of reasons, including overloading of circuits and improper wiring practices, floodwater increases fire danger through short circuits in wiring and electrical equipment. Have a plan in place for responding to floods and flash floods and, if you are a business owner, write your plan out. Obtain flood coverage at adequate limits. Plan ahead of time so you are not caught off guard in the event of a flood. Identify whether your building is located in a flood plain. Your local emergency management office can assist you and FEMA flood zone maps are also accessible online to the public. Learn the elevation of your building in relation to streams, rivers and dams as well as the history of flooding in your area. Consider the need for damming and diking supplies such as sand bags, flood shields and sheet metal covers to keep floodwaters out. Make sure an adequate number of portable fire extinguishers are available. Move stored goods off the floor. Move records, computers and other electronic items to a protected area in the facility or off site if possible. Move or raise containers that hold flammable and combustible liquids as well as compressed gases to a safe place. Shield fire protection equipment from damage during a flood. Barriers should be in place to protect against buoyant materials rising and damaging sprinkler system components such as piping and risers. Consider the need for backup systems, such as generators, gasoline-powered pumps or battery-powered emergency lighting. Consider portable and fixed sump pumps to remove floodwater. Develop a records retention and backup program to ensure vital business records and computer data are not lost during a storm. Purchase a National Oceanic and Atmospheric Administration Weather Radio with a warning alarm tone and battery backup. After a flood, contact your insurance agent or carrier, then conduct a damage assessment as soon as the area is safe to enter. Start salvage operations as soon as conditions permit, with pumps provided for removing water from basements. Debris, both inside and outside, should be hauled away immediately. Make efforts to check for possible washouts that may have undermined roads, buildings, water mains and gravity tank foundations. Report downed overhead power lines to the appropriate utility. Take extreme caution around downed power lines. Avoid them until a qualified professional has evaluated them and deemed the area safe. Clear fire hydrants of any debris that might hinder fire department access. Clear fire exits of debris and floodwater barriers. The fire evacuation plan may need to be re-evaluated to accommodate flood damage. Monitor any use of generators closely to prevent the creation of additional hazards. Do not energize equipment that has been flooded until it has been properly cleaned, dried out and the insulation tested. Coverages described here are in the most general terms and are subject to actual policy conditions and exclusions. For actual coverage wording, conditions and exclusions, refer to the policy or contact your independent Bolder Insurance Advisor.